The Estonian national selection show is called “Eesti Laul”. This year it has been the 6th edition of this format. It’s absolutely fascinating how much creativity and enthusiasm the Estonians contribute into this music show. There are a lot of innovations, new music styles and unusual very up to date compositions. Out of ten finalist, the top favourites Elina Born & Stig Rästa made the race with 79% of the televotes. 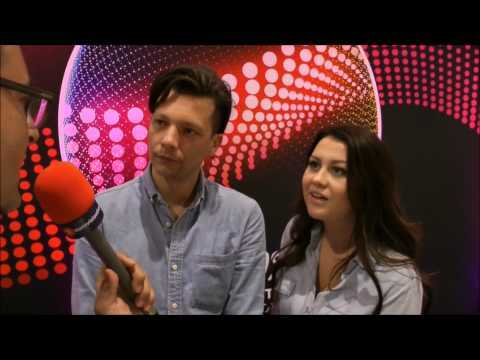 Also the juries were convinced that the song “Goodbye To Yesterday” might be the right choice for Vienna this year. The duo consist of Elina Born, who was born in Lehtse, Estonia – east of Tallinn in 1994 and Stig Rästa, born 1980. Both have been working together for several years, while Stig is composing songs for Elina. Elina became well known in Estonia as she made a second place in the Estonian Super Star. In the Eesti Laul 2013 Elina made the 8th place. Stig has been the guitarist in several Estonian bands such as Traffic, Slobodan River and Outloudz, which are also familiar with the Eesti Laul. He is also a singer, song writer and record producer. The arrangement of the song “Goodbye To Yesterday” is a truly masterpiece! In the Estonian selection this songs has already been handled not only as top favourite in Estonia, also internationally – the English bookmakers have predicted the song as the ESC winner, even if the majority of the songs were not known at that time. In the Estonian iTunes charts this song has been #1 even before the song has been taking part in the Semi Final. The song is a melancholic country number with a very melodic special hook. The stage performance of Elina and Stig is perfectly choreographed. “Goodbye To Yesterday” is not only a good radio song, it will also have a great potential to be a hit in Europe. This is probably one of the strongest entries this year in Vienna! Congratulations! Estonia had its debut in the year of 1994. In the year before there has been an international pre selection, hold in Ljubiana, Slovenia to choose three songs for Millstreet. The Estonian entry “Muretut meelt ja südametuld” sung by Janika, did not make it in that year. Nevertheless the Estonians really become Eurovision enthusiasts over the years, this year in Vienna it will be the 22nd time for Estonia in the ESC. There have been many good and memorable songs with good placing’s. Estonia reached the Grand Final 13 times and even reached a Top10 position 10 times! In 2001 the big dream for Estonia came true Tanel Padar and Dave Benton made a surprise victory with a soul dance number “Everybody”. At that time it was the very first Eastern European country to win the ESC. The year after the Estonian broadcaster ETV has organized a wonderful event in the capital of Tallinn.